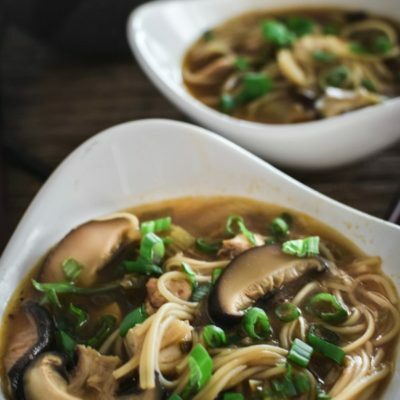 Although Hot and Sour Soup is not an Italian recipe — it’s a great soup to make during this cold weather. Not only is it good for when we feel under the weather, it’s a bowl of cheer any time of year. 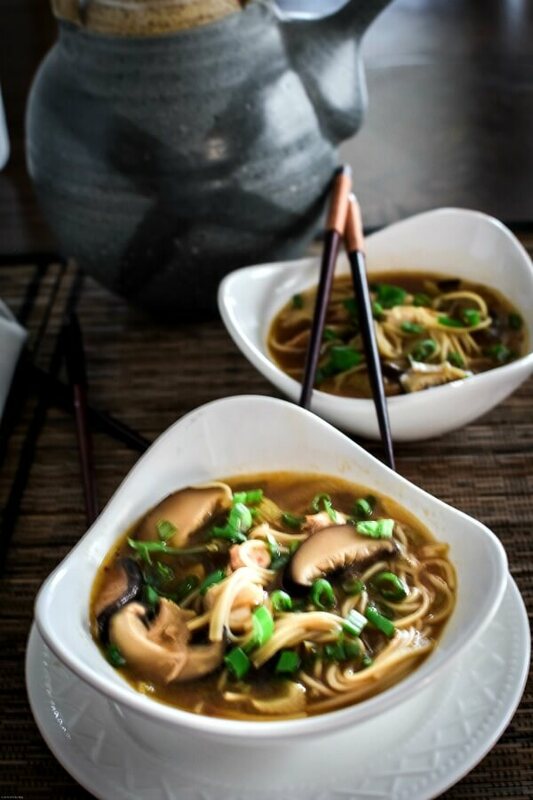 Its warmth comforts while the broth’s peppery spice heats you from the inside out. Hot and sour soup is on practically every Chinese takeout menu and buffet. But this recipe is a million times better than what you get from a restaurant. Take a sip, instant gratification. This recipe has been updated from the original February 2015 version in order to provide a better experience for our readers. Last update March 2019. 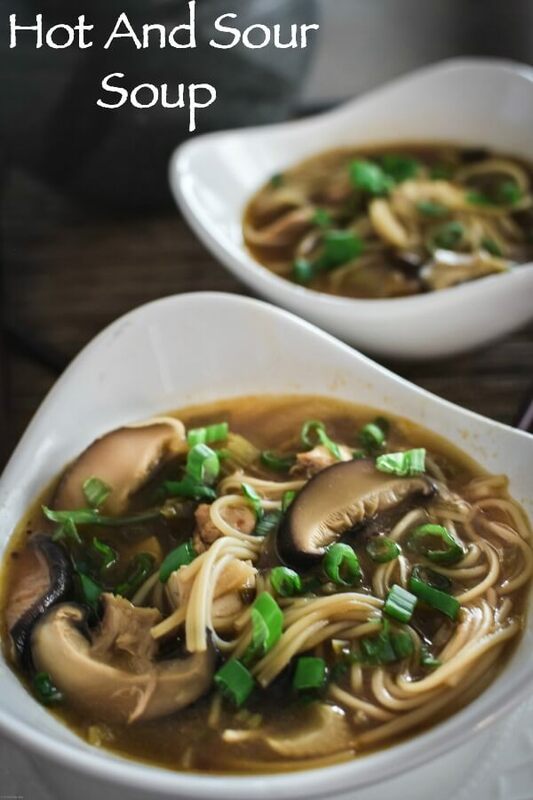 For this recipe you’ll need: chicken breasts, chicken stock, celery, green onions, Chinese chili sauce, sesame oil, soy sauce, sugar, white pepper, dried black mushrooms, rice vinegar, bamboo shoots, water chestnuts, Chinese egg noodles, cornstarch, eggs (optional). The chicken broth makes our Hot and Sour Soup a very light soup, and it’s the Asian chili sauce (sambal oelek) that gives it a spicy punch. We enjoy this soup often throughout the year. We certainly don’t wait for just cold weather. Minestra – soup was a staple in our household, and today both my Honey and I still derive a great deal of satisfaction from making and eating soup. Whoever makes soup knows that it is practically impossible to make a small batch. By the time you put a little of this and a little of that into it, you’ve got a pot-full. You don’t need a lot of fancy expensive ingredients for this soup. Most of the items you can purchase in the grocery store. 1. Add veggies. 2. Water Chestnuts and bamboo shoots. 3. Add Soy Sauce. 4. Rice Vinegar. 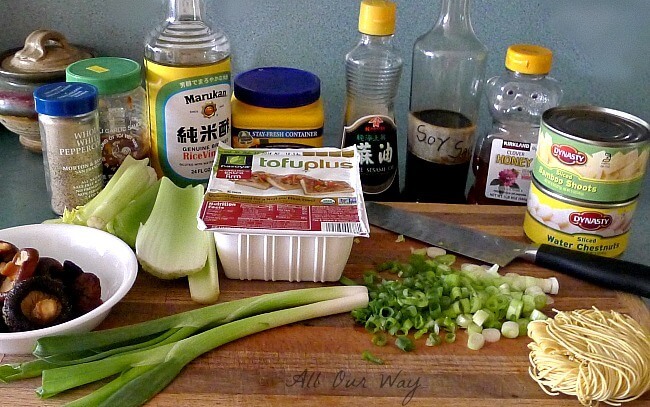 If you have an Asian market nearby, you can find the ingredients even cheaper there. As you can see we prepare the ingredients ahead of time — it’s so much easier because you don’t have to measure, dice or search for an ingredient. 5. Hot sauce. 6. Sugar. 7. Chicken Stock. 8. Black Mushrooms rehydrating in stock. We’ve mentioned this a time or twenty — we like spicy and hot!! 9. Dice extra firm tofu. 10. 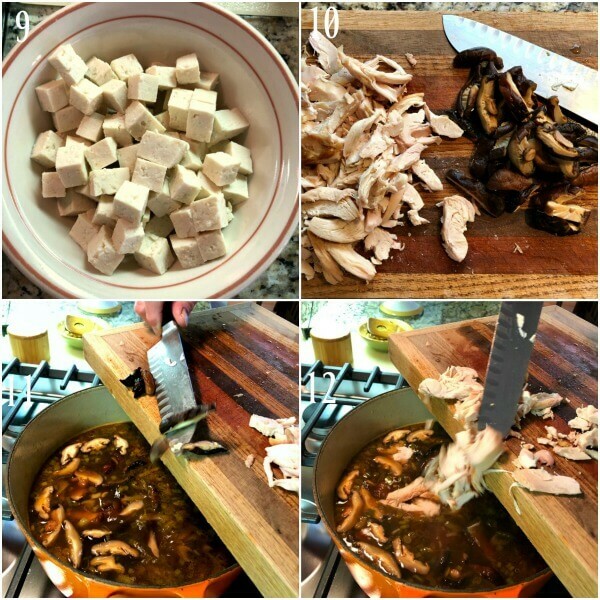 Shred chicken and slice rehydrated black mushrooms. 11. Add mushrooms to soup. 12. Add shredded chicken to soup. This soup is a little deceptive when you take your first sip. The kick of the heat hits after you swallow. You may have to mop your brow a bit, but it is oh so good you won’t want to stop eating. 13. Make a slurry. 14. Add noodles to soup. 15. Add extra-firm tofu to soup. 16. Mix well. You can add less of the Asian chili sauce. It all depends on your heat tolerance. 🙂 This is a great recipe to make your way. We love trying new and different dishes — do you?? Mangiare è un’avventura — Eating is an adventure. 17. Add slurry to soup and simmer a few minutes. 18. Plate and serve the hot and sour soup. These recipes are classics at our house. The following are affiliate links. We are a participant in the Amazon Services LLC Associates Program, an affiliate advertising program designed to provide a means fo us to earn fees by linking to Amazon.com and affiliated sites. Thanks so much for bing a part of All Our Way! Just take one whiff of this soup and it will immediately make you feel warm and happy. It has a light chicken broth as its base and it's so easy to make. You may adapt this recipe to your liking and you may just want to make a double batch to have on hand. You can freeze it, just follow the recipe notes. There may be no miracle cures for what ails us but this soup sure comes close. 8 dried black mushrooms -- more if you like. Slice once they have been softened. Cook the 2 chicken breasts in 2 cups of chicken broth letting the breasts gently simmer for 15 to 20 minutes until cooked through. Let cool then shred with fork. Save the chicken broth to add to the soup. If you use rotisserie chicken breasts, shred them and add the 2 cups of broth to the overall liquid. 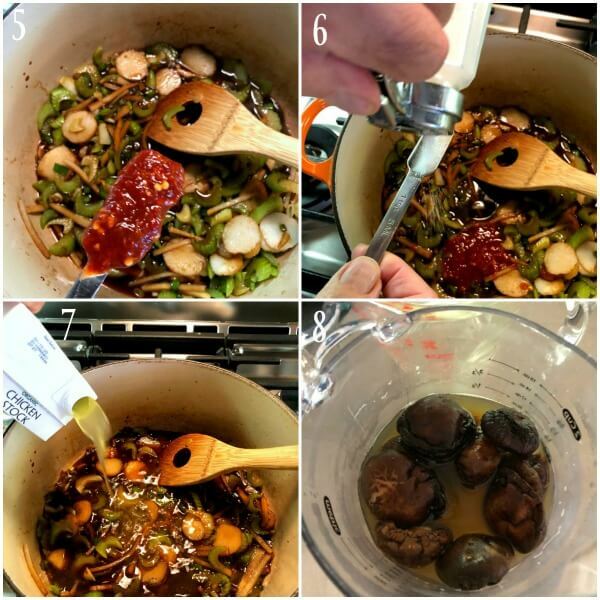 Mix cornstarch with 2 tablespoons of soy sauce, set aside. Soak black mushrooms for 20 minutes in 1 cup of chicken stock. I use a French press to keep the mushroom submerged in the liquid. 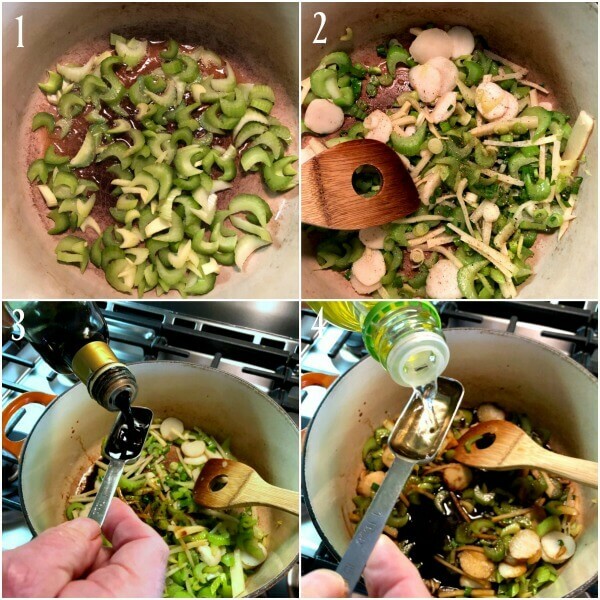 In a Dutch oven or deep pot sauté the diced celery in the 1 1/2 tablespoons sesame oil until soft. Add the green onions and sauté for 15 seconds. Add the bamboo shoots and water chestnuts. Add 4 Tablespoons soy sauce, vinegar, pepper, chili paste, and sugar. Stir together. Now pour in the chicken stock and reserved liquids into the pot and bring to a simmer. Cook for about 10 minutes. Add the sliced black mushrooms, shredded chicken and let the soup come to a simmer again. Simmer about 5 minutes. Add the tofu. Stir in the cornstarch soy sauce mixture along with the Asian egg noodles nest. Simmer for 2 minutes. If you want eggs beat them with 1 1/2 teaspoon sesame oil. Whisking with fork, pour into the simmering soup in a fine stream. Garnish with a little green onion when serving. We like our soup spicy but you can increase or decrease the seasonings to your taste. Note: Recipes and content from ©All Our Way are copyright protected. Please do not use content or recipe without prior written permission. If you want to share the information please link to this post. Thank you. 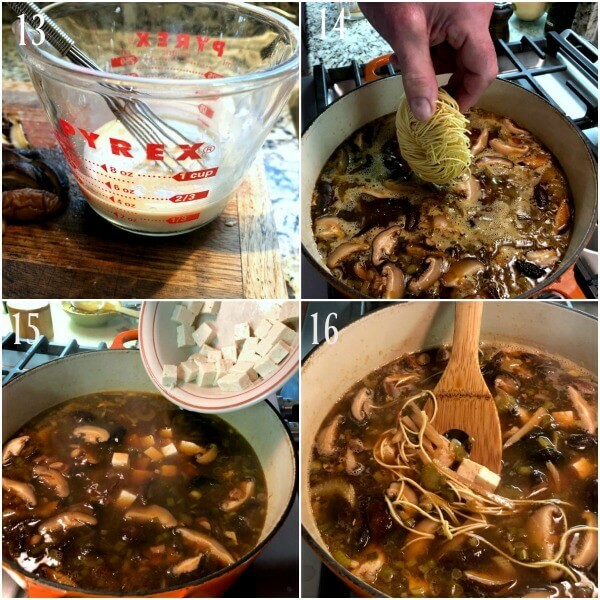 I like this hot and sour soup, this makes perfect weeknights dinner. Mushroom gives out earthy flavor I need to try this recipe . I love to order hot and sour soup when we order Chinese take-out. It is the best accompaniment to my meal and I love the contrasting flavors! This looks like the perfect soup to warm up with while winter lingers on a bit longer. I also think it would be superb to make when you’ve got the sniffles because it has a lovely broth and a kick of spice from the chili sauce. Great recipe, Marisa! Grande MARISA come sempre la tua(la nostra) passione la esprimi al meglio…..Thanks…Keep them coming. I like it spicy too! What a delicious meal, I can’t wait to give this recipe a try! Homemade is better, Tammy, and the hot and sour soup is excellent. You made a perfect hot and sour soup, I like the addition of sambal oleak . 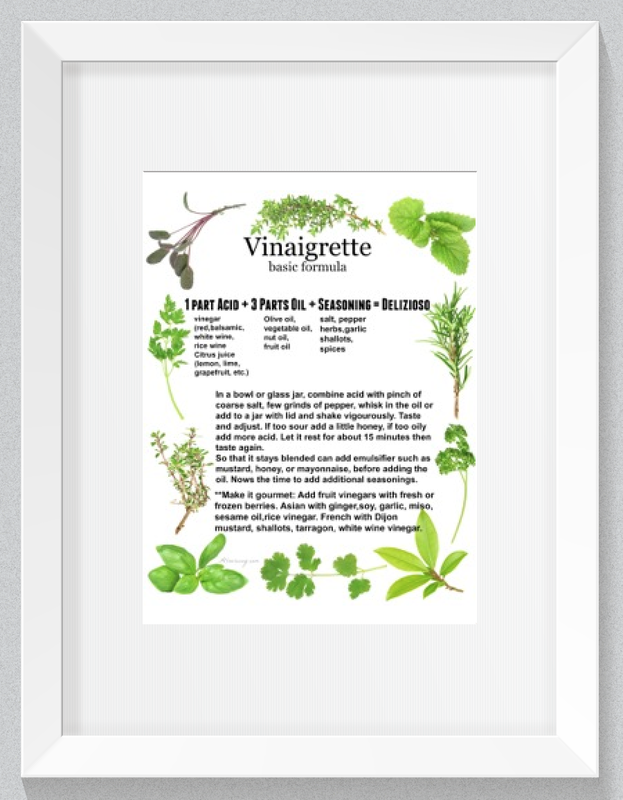 it is staple in my house, I like to add to most of the recipes. The tofu in the soup makes it filling one. My husband loves hot and sour soup! Thank you for this simple yet delicious recipe. This is my hubby’s favourite soup to order from our local Chinese take-out. It will be perfect for the cooler weather days ahead, and give me bonus points for being a good wife! I love hot and sour soup. Love the flavors you have in this recipe. Sounds like a perfect comfort soup. This is one delicious looking soup Marisa. It’s so healthy too. I love the Asian flavors and my hubby is a fan too. Can’t wait to try this. I love hot and sour soup. My mom often made it and we loved it as kids. My kids, unfortunately, do not fancy it. I must try this recipe. Love the flavors you have in this recipe. Sounds like a perfect comfort soup. This soup always draws my eye when we’re out to eat … I never considered making it at home. Why Not?! Thanks for sharing a recipe that I can use to satisfy some cravings. Thats amazing this soup is always been a favorite and I have never tried to make it. I sure will have to put this on my list of must makes of your recipes! My elder one and husband love this kind of hot and sour soup and I can really do with a big bowlful right now. I usually don’t add noodles but now you have given me the idea to do so! I have never tried hot and sour soup before. I see in on menus all the time, but know I think I really need to give this a try. With comfort food season next in line…this would be the perfect time to experiment with this. That sounds flavorful. I have a friend who’s really getting into tofu that might like to try this. Hot and Sour soup is my favorite soup of all time. I could seriously eat it by the bucket full! 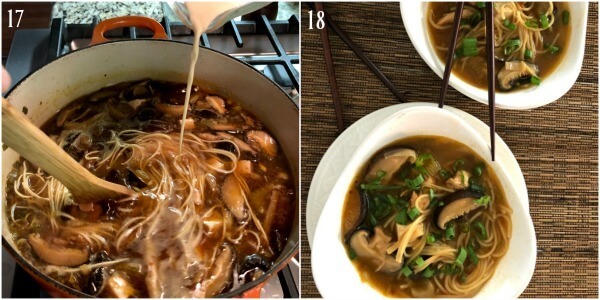 I love hot and sour soup, my husband isn’t much of a spicy fan, but if it’s cold outside, he will give anything hot a go 🙂 Looks delicious! This soup looks very comforting and delicious! Perfect for this cold and rainy weather! I heartily agree! We simply love soups– they make such good lunches or dinners with a delicious panini.I’m getting hungry writing about it. Thank you for commenting. 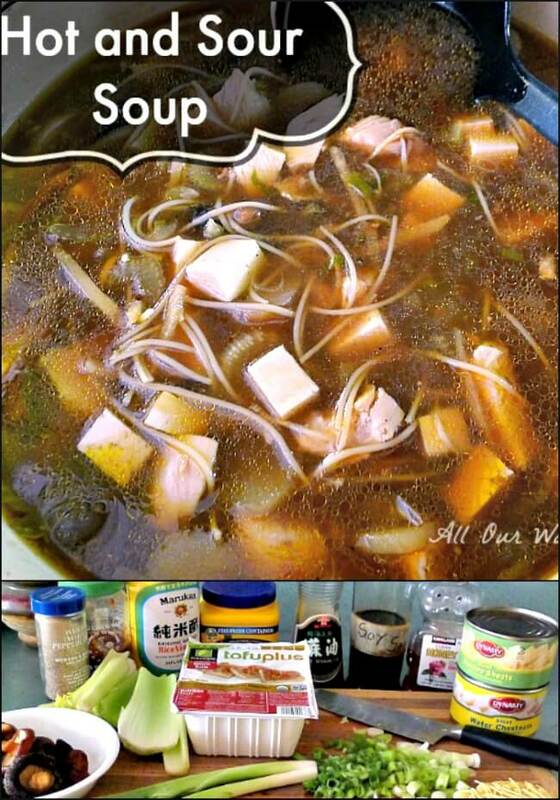 We love hot and sour soup but have yet to make it; thanks so much for this wonderful recipes! You’re very welcome! I may be Italian but I love all types of soup. They are so comforting, don’t you think? This is on of my mom’s favorite soups. Thanks for the recipe so that I can make it when she comes to town over the holidays. We really make this soup often. Our oldest son loves it!! Let us know how your mom likes it?? I adore Asian food, spicy food, and comfort food — your recipe hits all three for me! This is a lovely dish to enjoy on a cold night! Thank you Patricia! It is light but it does spice up your taste buds. Hope you try it. What a wonderful, light and easy soup! It looks great! I do love this sort of Asian soup, warming without being heavy, and very refreshing and adaptable. I am currently brewing a cold so am craving a bowl right now. I certainly hope you feel better soon. If your head is stuffy this soup would be just the thing — the spice in it does wonders. We make this soup all the time — we are simply soup lovers and this is loaded with taste but light. Yum!! We LOVE soups, and this soup recipe was posted just in time! Our weather here in NW Indiana has been in the “minus” columns the last day or two. We need soup, especially spicy hot soup, to warm us up! Thanks, Marisa! This will be my project for tomorrow! This will certainly warm you up. This is a great soup and one you can make at home. It is our favorite Chinese soup to order but we do not have good Chinese restaurants in our area. I have made this soup a few times and your post reminds me it is time to make it again. This time I will use your recipe. I think you’ll like this recipe — just suit to your heat tolerance. Hi Marisa, how I love soup too and Asian food is amazing. Pinning if I can find all these ingredients (I’m sure I will!) I will be giving it a try. Looks and sounds delicious. Have a great weekend. From the last time we were in Italy we saw a lot of Orientals there — perhaps you’ll find the ingredients.